In Latina, we learned all about Sonia Sotomayor's personal life and style. A new profile in the New Yorker thoroughly probes her work life and relationships to paint another picture of the justice as intellectually savvy, confident, and compassionate. Running twelve long pages, Lauren Collins's piece delves deeply into Sotomayor's past, relying heavily on the testimony of friends and congressional gossip to reveal how much was at stake with her historic nomination, and how long a climb it actually was. Collins's article deserves a deep reading on its own merit, but here are eight items that stood out to me as particularly telling. By the end of the hour allotted to the case, Justice Sotomayor-wearing a snaky silver cuff bracelet and with her fingernails painted sports-car red-had spoken five times. This is normally positioned alongside other quirky characteristics of Sotomayor, like her card-sharking ways. No, seriously. The financial-disclosure form that she filed with the Senate revealed that, in 2008, in a Florida casino, she had won $8,283 playing cards. During the nomination process, Sotomayor's background was carefully scrutinized, and she was instructed to camouflage or obscure some of her normal habits. In some ways, her embrace of her own cosmetic preferences and hobbies over what is considered to be safe or acceptable signal she is not ashamed of who she is or where she has come from. Assimilation requires a very high price and her refusal to do so is an amazing stand for individual truth. There is nothing inferior about wearing colored nail polish, or wearing an off-the-rack suit to work, or rocking hoop earrings. Just as many of us are asked to remove our ethnic and regional markers in exchange for success (straightening hair, tightening diction, and avoiding items that call attention to the wearer) Sotomayor's subtle - but persistent- refusal to fall in line implies much more than a love of candy apple red polish. In contrast to the conservative answer to Silent Bob, Sotomayor assumed the bench and peppered the presenting attorneys with questions. Friends quoted in the New Yorker mentioned she wanted to be ready "on day one" to make a contribution to the court. And has she ever - Collins notes Sotomayor "asked a hundred and forty-six questions in the course of thirteen arguments (average: 11.2 questions per argument)." However, Sotomayor's questioning was not idle puffery - Sotomayor is revealed to be a skilled interrogator on the bench, who often uses her questions to force attorneys to clarify their positions. The day before, in the Court's opening session, she had spoken thirty-three times, more than any other Justice. In contrast to some of her peers, who pondered historical parallels (Justice Antonin Scalia: "What about a new Adolf Hitler?") or posed absurdist hypotheticals (Justice Samuel Alito: "Suppose you have the Ethnic Cleansing Channel on cable TV? "), she took a nudgy, earthbound approach ("What do you mean by ‘even-handed,' please?"). She did not traffic in punch lines or brainteasers. Her hypothetical was an actual. You could imagine Sotomayor, who had ditched the frilly jabot she had worn in her official portrait (a gift from Justice Ruth Bader Ginsburg), becoming curious about pit-bull documentaries and calling up some David Roma clips on YouTube to check them out for herself. The Sotomayor nomination process brought up an ugly dynamic that professionals of color know all too well - the double assumption that a position was earned and "given" without any demonstration of merit. Despite Obama's praise, and photographs of Sotomayor's angelic mother, Celina Sotomayor, dabbing at her eyes during the press conference, the rollout got off to a slightly sour start. In early May, a widely read article by Jeffrey Rosen in The New Republic, entitled "The Case Against Sotomayor," had quoted an anonymous source as saying that Sotomayor was "kind of a bully on the bench," "domineering," and "not that smart." The piece generated six hundred and forty-two comments on the magazine's Web site, many of them incensed. Rosen eventually softened his criticisms, but the insinuations lingered. The day after the nomination was announced, Dana Milbank wrote in the Washington Post that Obama had opted for "biography over brain." Many of the potshots were glancing (Newt Gingrich Tweeting that Sotomayor was a "Latina woman racist"), but the perception that Sotomayor was a temperamentally and intellectually invalid candidate, posited largely by backers of other candidates during the selection process, had infiltrated the debate. In June, Ted Shaw, a former head of the N.A.A.C.P. Legal and Educational Defense Fund, and a high-school classmate of Sotomayor's, exclaimed to me, "She was at the top of our class, which was ninety per cent white. For those who suggest her intellectual background is not strong-well, all the white folks were below her!" 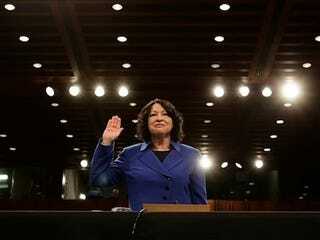 Sotomayor was confirmed as a district-court judge with the unanimous consent of the Senate in August, 1992. "The hearing was wonderful," she said later. "Because a Democratic senator had proposed me and a Republican President nominated me, my questions were pro forma." Five years later, in June of 1997, President Clinton submitted her name to the Senate as a nominee to the Second Circuit Court of Appeals. Things proceeded smoothly until the hearing. "Unfortunately, at 12 noon of the day of my hearing, Rush Limbaugh decided to devote his radio show to my nomination," Sotomayor recalled later. Limbaugh's objections were strategic: Sotomayor was on a "rocket ship" to the Supreme Court, he warned. It was March, 1998, before the Judiciary Committee voted, 16–2, to send Sotomayor's name to the full Senate. The nomination stalled. Finally, in October, amid intense pressure from Hispanic groups-Sotomayor's supporters sent ten thousand letters to senators-Sotomayor got a hearing. She was confirmed, 67–29. After the experience, she sounded unusually cynical. "Although we all wish to believe that appointments are only the product of merit, the harsh reality is that the support of community groups is critical to insuring that meritorious candidates are not overlooked or victimized in the appointment process," she said. "Empathy" became the code word for reaching decisions on issues of race and gender that Republican senators didn't like. And "code words," decried by Senators Ted Kaufman and Sheldon Whitehouse, became the code word for making comments that Democratic senators thought were racist and sexist. Sotomayor has an awareness of the practical, almost bodily concerns that can affect the law. "Prepare a small volume of just the critical documents so the judge can refer to them easily or take them home without losing an arm," she once counselled a group of young attorneys. To another, she said, "Filing and serving a restraining order on the eve of a holiday may be procedurally permissible, but it is both inhumane and unfair." In a speech, she recalled Titi Gloria, a seamstress, babysitting her in a dark, airless sweatshop. "Titi would vigilantly chase me away from the door all day long," Sotomayor wrote, adding that it dawned on her only later that they were hiding from the police. "Forget first Latina," Ted Shaw, her former classmate, said. "She's the only Justice I am aware of who's ever grown up in a housing project." In 2000, at the graduation ceremony of the Bronx Leadership Academy, Sotomayor had said, "It is so exciting to be at the door of a major change in one's life. That's why brides and bridegrooms smile so much at weddings and why so many tears of joy are shed when a wanted child arrives"-her unprompted use of the phrase "wanted child" acknowledging the possibility that an expectant parent could feel otherwise. Collins describes an interesting scene during the nominations process. The Congressional Hispanic Caucus spearheaded the movement to ensure Sotomayor was on the President's short list, but felt they needed more support. In a rare show of inter-community organizing, they chose to ask for help. Latino leaders also lobbied their black counterparts to the cause. "The concern of some people, and I believe some in the White House, was with what political capital they could use in nominating a Latina in terms of the black community, who feel that Clarence Thomas doesn't represent them," Velázquez said. On the House floor, Velázquez approached the North Carolina representative Mel Watt, who serves on the House Judiciary Committee, and who formerly chaired the Congressional Black Caucus. A few days later, Watt called Velázquez on a Saturday. "Nydia, I placed a call to the White House," he said. "I said, ‘If there's not a black candidate that makes the short list, we will be supportive of Sonia Sotomayor.' "
Clarence Thomas's experiences in the seventies caused him to embrace individualism; Sotomayor's made her an establishmentarian. [...] Unlike Thomas, Sotomayor has wanted to be a representative of a group." In 1977, she entered Yale Law School. There, she made law review with an esoteric note that examined a constitutional principle called the equal-footing doctrine in the light of the Puerto Rican statehood movement. If Puerto Rico became a state, Sotomayor asked, would it keep the mineral rights to surrounding seabeds? She forged a narrow compromise, asserting that, while equal footing prevailed under most circumstances, Congress was entitled to make certain exceptions. "She was navigating between two very difficult questions to find a practical, workable solution," the Yale Law School professor Stephen Carter, who edited the note, said. Sotomayor is perceived as being more liberal in cases involving immigration. Although an analysis compiled by Senator Schumer's office suggested that her rate of deciding with the government-eighty-three per cent-was consistent with that of the rest of the Second Circuit, she drew notice, in her first Supreme Court opinion, by using the terms "undocumented immigrant" and "undocumented worker" instead of "illegal immigrant." Bruno Bembi, a lawyer who has argued several immigration cases before Sotomayor, said, "If there was a way that you could interpret the matter so that you could give the alien the benefit of the doubt, or go along with some of the Ninth Circuit"-the liberal California court-"cases, she would give that to you if it was reasonable." Judge Rosemary Pooler said, "She was very thoughtful and very willing to try to find ways, within the tight system that has evolved, for immigrants to achieve asylum." Sotomayor's concurring opinion in Lin v. United States Department of Justice (2007) may epitomize her jurisprudence. In the case, three Chinese aliens-the unmarried partners of women who had been subject to China's forced-abortion policies-petitioned for automatic asylum on the basis of persecution. The majority rejected their claim, ruling that automatic asylum did not extend to spouses or to unmarried partners. Sotomayor's opinion united two sometimes conflicting strands of her jurisprudence-an aversion to going beyond the issues at hand and a concern about the effects of laws on people-citing dry procedural principles to reach a compassionate conclusion. Since the petitioners were unmarried, the Court had erred, she wrote, in considering the question of whether partners and spouses should be permitted asylum ("Today's decision marks an extraordinary and unwarranted departure from our longstanding principles of deference and judicial restraint"). But, since it had, it should have realized that spouses can experience persecution by association ("The termination of a wanted pregnancy under a coercive population control program can only be devastating to any couple, akin, no doubt, to the killing of a child"). As anyone who has ever been a "first" knows, to achieve that measure of success tends to have stressful impact on one's sense of self. "To her great credit, she has very little of el complejo colonial, [roughly defined here] the doubts that afflict so many of us," Judge José Cabranes, Jr., of the Second Circuit, told me. But Sotomayor, despite her outward equanimity, has been a quiet seeker, contemplating, in her undramatic way, what she has called "the pathology of successful Latinos." As much as she has celebrated her Puerto Rican identity, she has also sought to escape what she has called "the gripping and narrowing tentacles of life experiences." In a profession that values the illusion of infallibility, Sotomayor has been unusually willing to acknowledge murky areas. In her writings and speeches, she has returned to key texts: Stephen Carter's "Reflections of an Affirmative Action Baby"; Carol Gilligan's "In a Different Voice"; Judith Resnik's "On the Bias: Feminist Reconsiderations of the Aspirations for Our Judges"; studies in the journal Judicature on how women affect judging. She acknowledges a tension between the ideal (experiences do not influence us at all) and the real (experiences affect us), and suggests that, while we should continually work toward the ideal, we ignore or neglect the real at our peril. From Resnik, Gilligan, and the Judicature essays, she takes the idea that women are different from men, combining it with Stephen Carter's thesis that there is no single "people of color" voice (or "female voice," for that matter), to conclude that "excluded people" are different, but they are not all different in the same way. Ultimately, Sotomayor has a long way to go while creating her legacy on the court. Her longtime friend Ken Moy is hopeful though, explaining that "Sonia was always able to find the levers inside existing structures." Collins explains how her ideas for reform are far from separatism, but require engaging systems in order to "perfect them:"
Sotomayor has attempted not to demolish institutions but to transform them from within. She has an uncanny ability to challenge authority without invoking its wrath. [...] Sotomayor believes in the perfectibility of systems. Several of her former clerks attributed her impatience with unprepared lawyers to her reverence for the judicial process and her faith that, if it is administered meticulously, it will achieve the correct result.